This is a big week for fans of funk, soul and good music. 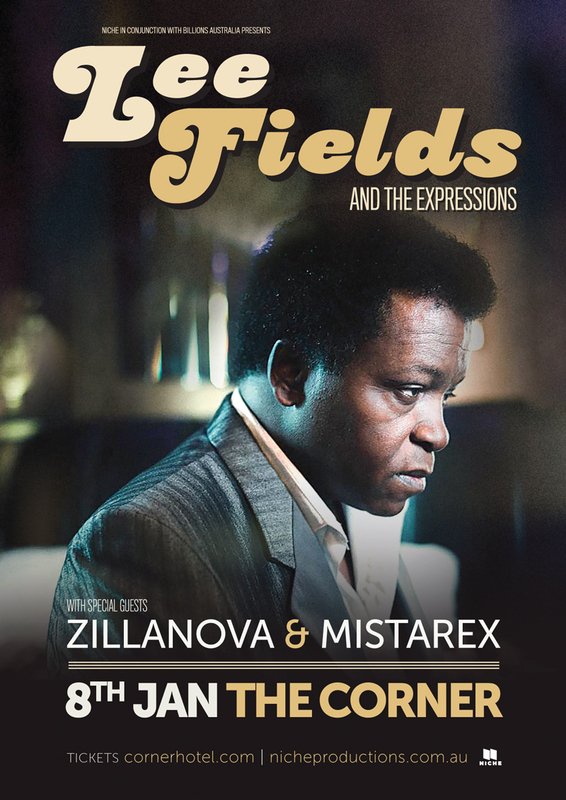 We are super excited about Lee Fields & The Expressions playing their first ever Melbourne Show at the Corner Hotel on Wednesday Jan. 8, and we’re equally stoked about the return of Japanese funk machine Mountain Mocha Kilimanjaro the following night, Thursday Jan. 9, once again at the Corner. Both of these bands are driving forces in the global funk & soul scene – and creators of some of the finest vinyl records to hit our shores in recent times (Truth & Soul, Daptone, Black Fire Records). Adding to the excitement is the debut performance of Melbourne’s own Zillanova who recently released the critically acclaimed ‘Suicide/The Time it Takes‘ debut single. Featuring vocals from Cisco Tavares and Jess Harlen, Zillanova promises to bring a new dimension to Melbourne soul! Zillanova are supporting Lee Fields – on stage at 8.30pm. The following night HopeStreet Recording label mates, The Cactus Channel are supporting MMK – showcasing their unique cinematic soul sound that has caused a soul-commontion across the planet. Their second album ‘Wooden Boy’ has been voted the No. 2 on the top 50 album releases of 2013 by ParisDJs. We should also mention that Zillanova’s one and only release made it into London’s 22tracks.com – the best 22 of 2013. Congratulations to the team at HopeStreet Recordings. If you’re looking for music by any of these artists – check our store guide for a list of vinyl/music retailers in your ‘hood.